There have been quite a few academic papers written on the relationship between the weather and the stock market (links to 24 such papers are given below). Does lousy weather depress stock prices, and does the sun encourage investors to take on more risk? These are the types of questions that the papers try to answer. In this article we’re going to look at one such paper (Dowling and Lucey, 2005), on the basis that as the authors are at Trinity College, Dublin, they may know something about rain. The main reasoning behind most of the research into the weather and the stock market is the belief that investors’ mood influences their behaviour, and the weather can act as a proxy for mood (and, importantly, the weather can be measured). And this is the broad approach of the Dowling and Lucey paper. The paper actually tests for the relationship between daily Irish stock returns for the period 1988-2001 and eight mood proxies in total: two belief-based (lunar phases, Fri 13th), two biorhythm-based (seasonal affective disorder, daylight savings time changes), and four weather variables (cloud cover, humidity, rain and geomagnetic storms). We’ll just focus on the four weather variables here. The objective was to determine whether below average stock returns were associated with bad weather, and above average returns with good weather. 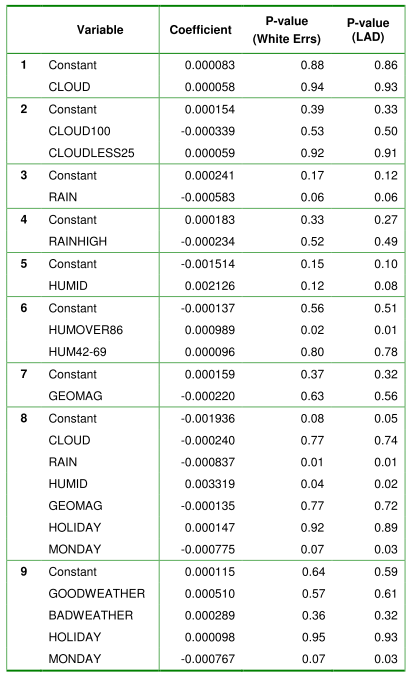 The results of their analysis on the weather variables are summarised in the following table. First, they were surprised to find a positive relationship between high levels of cloud cover and stock returns, however the relationship is not significant. Less surprisingly they did find a negative and significant relationship between rain and equity returns. Again, oddly, they found a positive relationship between humidity and returns. Regarding storms, there was a negative, but insignificant relationship. They then combined all four variables to create a generalised GoodWeather variable and a BadWeather variable, but found no significant relationship with either and market returns. As a further study they found some preliminary support for the theory that investors’ moods are more susceptible to influence if they are already in a good mood. Investors were defined to be in a good mood if the market index 10-day moving average was above the 200-day moving average. The authors found that mood states caused by the weather had influenced the stock market. Of the four weather variables they found the most significant relationship was between rain and equity returns. So, next time you consider selling a stock look out of the window and check if your mood is being affected by the rain. Other articles about the weather and stock returns. It has long been thought that there is some connection between the weather and stock returns. That when the sun shines, investors feel happy, they take on more risk and prices rise; and when the weather is gloomy, investors feel likewise and prices fall. 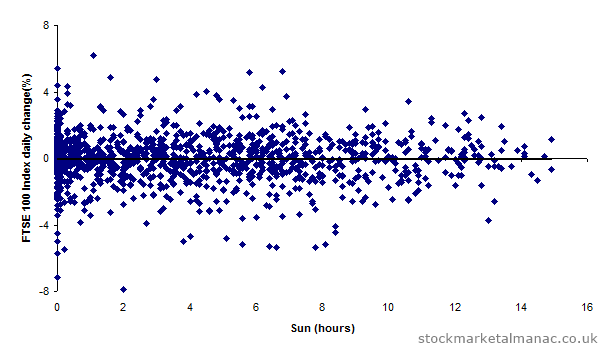 One of the most extensive surveys was conducted by Hirshleifer and Shumway in their paper Good Day Sunshine: Stock Returns and the Weather. 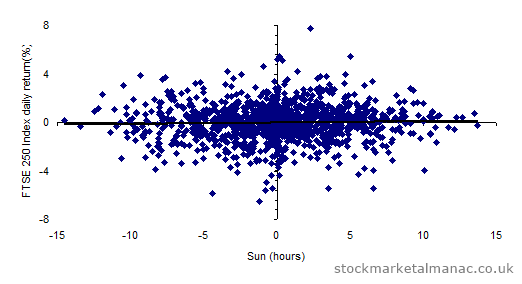 Hirshleifer and Shumway did find a positive correlation between equity market returrns and the amount of sunshine, but not for any other weather conditions (e.g. rain or snow). But the author of a new paper (Michael Schneider, Under Pressure: Stock Returns and the Weather) decided to take a new approach. Schneider took as his starting point the idea that investors have to directly experience the weather to be affected by it. For example, investors sitting in a neon-lit trading room can be largely unaware of whether it is raining outside or not. 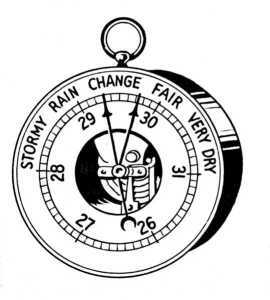 But what all people can be affected by, wherever they are, is barometric pressure. Elsewhere, psychological studies have shown that high barometric pressure can induce positive moods, and vice versa. Hence, Schneider ran his tests and found there was indeed a strong correlation between barometric pressure and stock returns. The barometric effect was greater for smaller, risker stocks. The result was economically as well as statistically significant. Controlling for all all weather variables, Schneider found that it was only barometric pressure that affects equity returns.